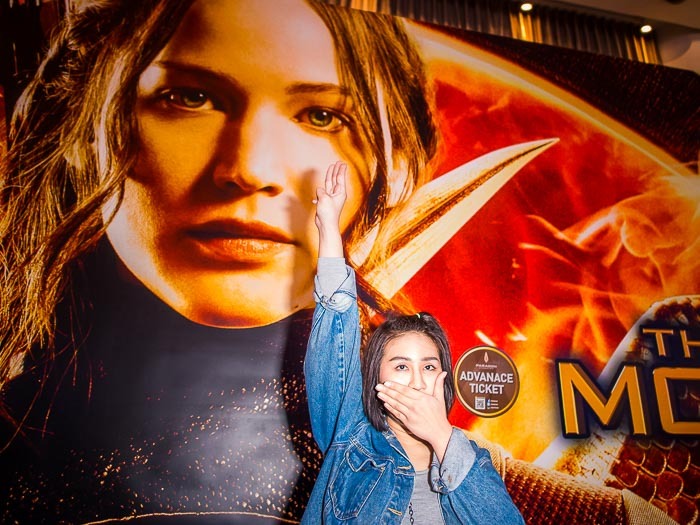 An anti-coup protestor displays the three fingered salute from the "Hunger Games" at the Bangkok premiere of Hunger Games: Mockingjay - Part I. A big Hollywood opening made an even bigger splash in Bangkok today. Hunger Games: Mockingjay opened and a movie about a plucky heroine with mad archery skills in a dystopian future became a flash point in Thailand's convoluted politics. The three fingered salute used by Katniss Everdeen and the others in her resistance are used by anti-coup protestors. Thais in the US and Europe who are opposed to the coup have used the movie's premiere to draw comparisons between the fictional "Panem" and Thailand. There have been rumors circulating for a weeks now that there would be protests at the opening of the Hunger Games. One of the theaters that booked Hunger Games cancelled it and is showing Woody Allen's "Magic in the Moonlight." Police officers in the lobby of a theater that cancelled the Hunger Games. There was a large police presence in central Bangkok today around the theaters that were showing the movie (or had planned to show it). There was also a large media presence. There were more photographers and reporters at the opening than there were police. And there were a lot of police. There were more police than there were protestors. There were very few protestors. Police ended up arresting at least three people at different sites. Two were arrested early, allegedly for talking to reporters and carrying George Orwell's 1984. 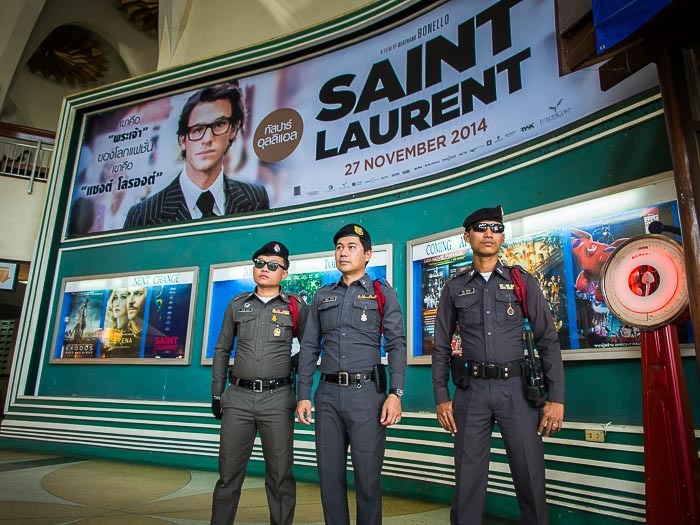 The third was arrested walking into the movie at Siam Paragon, an upscale mall in central Bangkok. She had spent time before the movie walking around the lobby flashing the Hunger Games salute and talking to reporters. A protestor walks through the lobby of the theater flashing the salute. Plainclothes police were waiting for her at the door to the auditorium and walked her out of the theater. Moments later she was pushed into an elevator and taken away in police custody. Usually when people are arrested at these protests they're taken to a local police station or military camp for "attitude adjustment." Most are released within a few hours. There are more photos from the Hunger Games protest in my archive or available from ZUMA Press.